The results from our 2017 Wildlife Portraits photo contest. One evening during a photographic expedition to South Georgia Islands, we spent some time in the small bay of Godthul. Some of us took the opportunity to hike up to the gentoo rookery and got some really nice sunset colours up there. 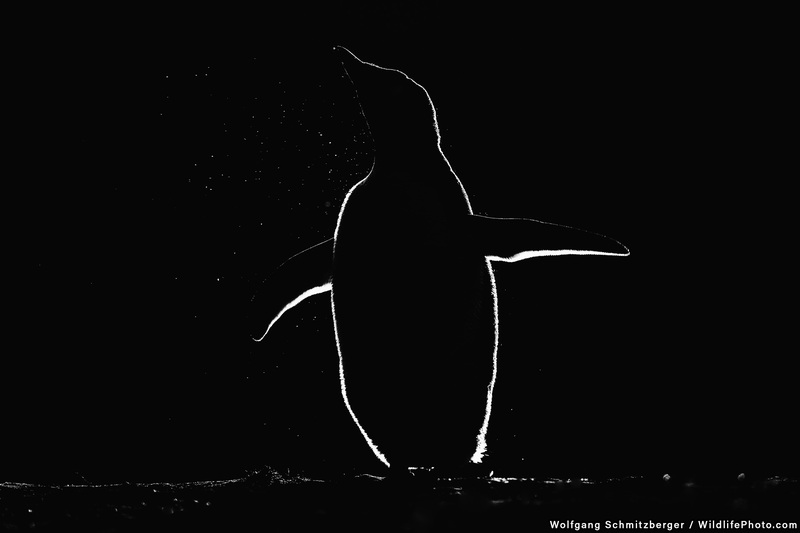 I had a specific scenery in mind and my goal was to focus on backlit pictures of the penguins up on the hill. I used my Canon 1Dx camera with my favourite 400mm f/2.8L IS II USM telephoto lens. The gentoo penguins up at the rockery were very busy building their nests, but some took the opportunity to stretch in the sun. This was really a magical moment up on the hill with the penguins in the sunset. The last boat returned to the ship long after sunset. Observing and photographing chimpanzees in Uganda's Kibale Forest was a challenge. From before sunrise we were out tracking a group of chimpanzees. All of a sudden the sounds of the group waking up were unmistakable and a good indication to get us on the right track. Once we found the group, they were high up in the trees or moving fast across the forest floor. It was early morning so they couldn't wait to get to the ripe fruit in the trees before other chimpanzees or other monkeys would beat them to it. Following them on foot, it was a matter of shooting fast when they sat down for a moment. Most of the time, however, we couldn't see or photograph them properly, so we sat down and waited as long as it took for them to start moving again. 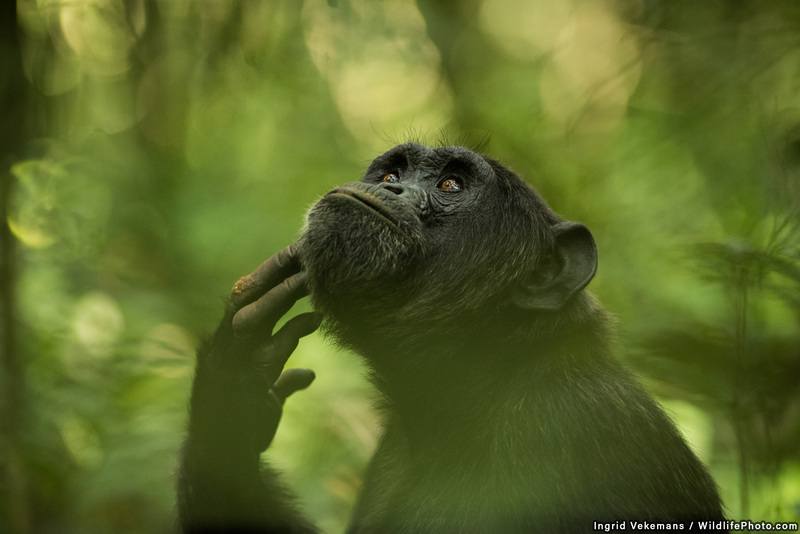 Taking this pose of reflective thinking, this particular chimpanzee displayed behaviour that reminded me of its close relative, the human being. In fact, the entire experience with them was a mirror of human behaviour and it was very touching to be so close to them physically but also to feel close to them emotionally. It is disconcerting to see wildlife making its home among discarded human waste, however it is becoming more and more common. 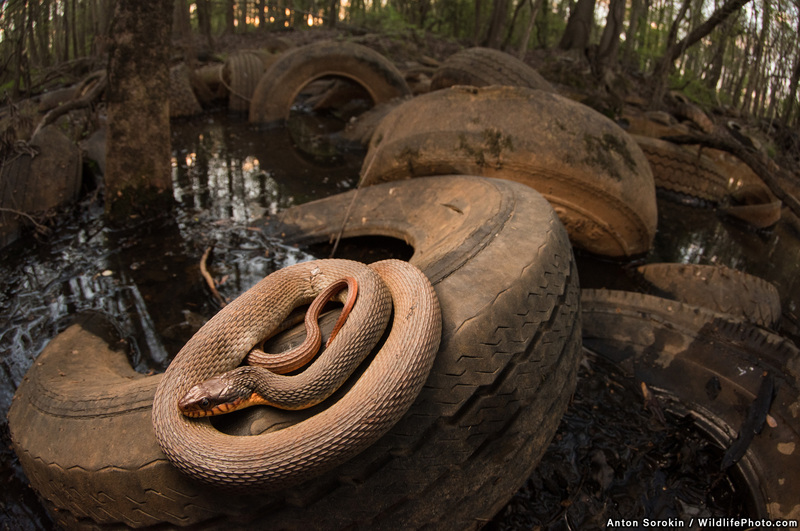 Which is why when I found this water snake in this swamp brimming with thrown away tires I attempted to accentuate its habitat rather than shy away from showing it. 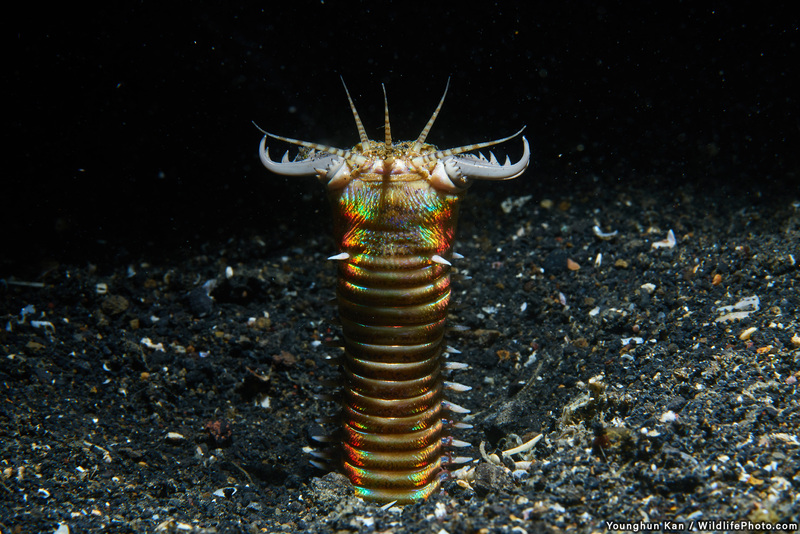 The bobbit worm is a terrible hunter of the sea. I photographed it in Lembeh, Indonesia. 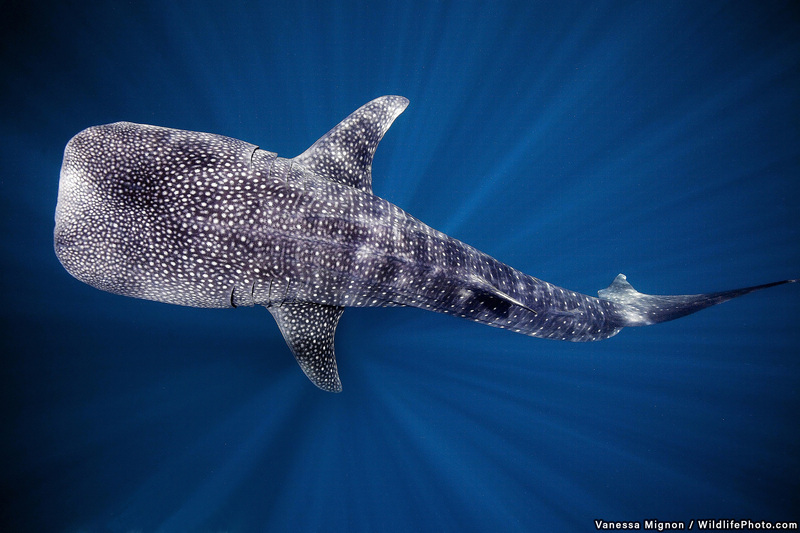 A whale shark, the biggest fish in the ocean, ascends to the surface through the sun rays. This picture was taken in Cenderawasih Bay, West Papua, where whale sharks are known to gather around the local fishing platforms. It took four planes and one night at sea to get there, but it was worth it as we were able to observe many whale sharks every day. They are beautiful gentle giants. Sadly their numbers have decreased and they are now classified as endangered on the IUCN red list. The photograph was taken with a Canon 5D Mark II, a Canon 16-35mm f/2.8 lens, Subal housing, with an exposure of 1/200sec at f/7.1 and ISO 320. 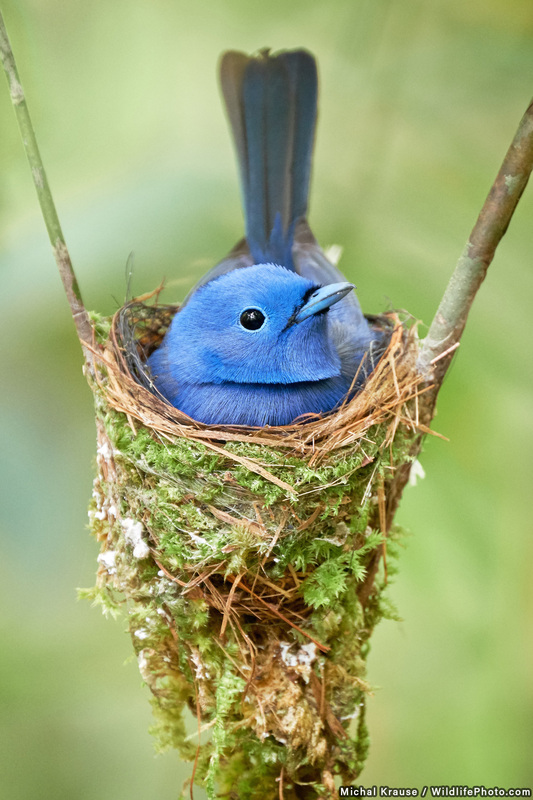 During our photographic trip to Sinharaja Forest Reserve in Sri Lanka, we found the nest of a beautiful black-naped monarch in low branches. Capturing this eye to eye portrait was a bit challenging. I was pretty lucky to find a view not obstructed by other branches and with a clean background, but due to the dim light in the forest and constant movements of the bird, most pictures were blurred. Even with photo taken during the late morning, I had to use high ISO and an exposure time of 1/10s. Only two or three photos were sharp and this is one of them. I have been monitoring and working with several species of mammal using DSLR camera trapping techniques since 2016. I find these techniques incredible because the pictures you can get are more natural when the animal does not notice you. 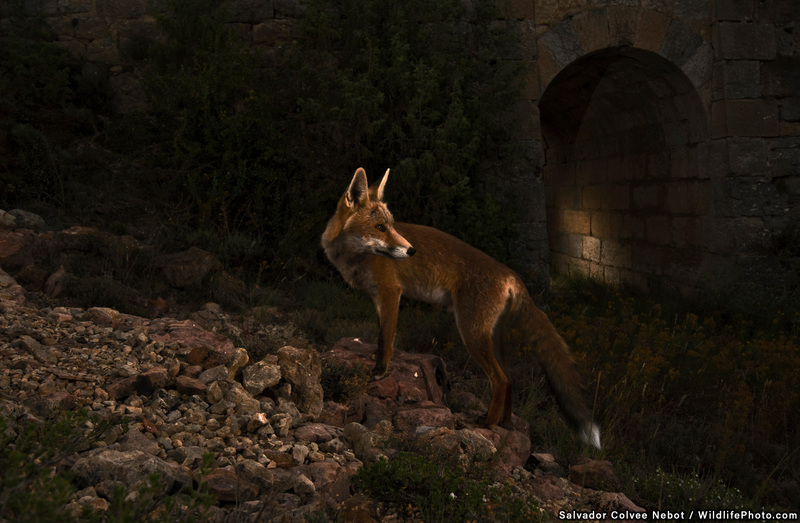 I found a family of five foxes near a village in Teruel, Spain, and I decided to leave the DSLR systems with flashes and a PIR sensor working for three months, just changing the batteries of the cameras, flashes and triggers each week or so. After more than seven thousand pictures, I photographed this male fox near an old Roman Bridge which is close to their den. I used a Nikon D7200 and a Nikon 10-24mm lens, three Nikon SB-28 flashes and one Camtraptions PIR sensor. The exposure was 1/125s at f/11 and ISO 800. 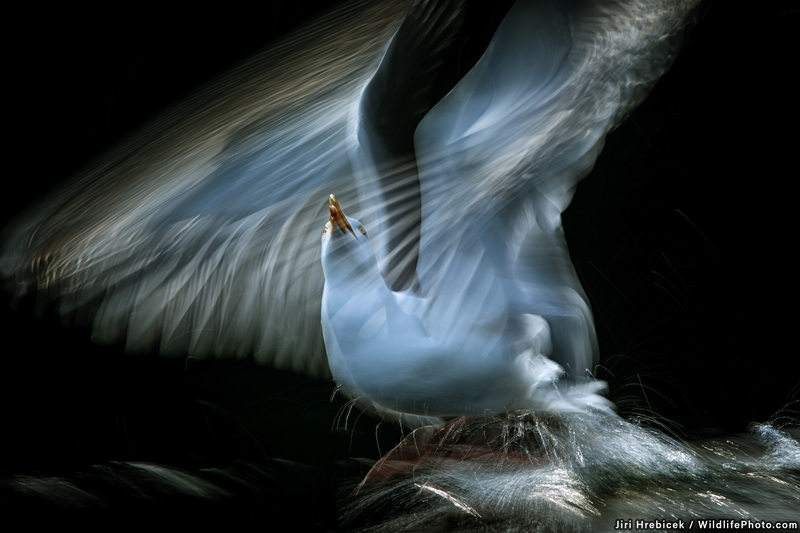 I have spent some time with seagulls in the dark Norwegian fjords. I tried to capture and visualise the motion and freedom of the birds as well as the melancholic mood of the place (being inspired by Jonathan Livingston's Seagull story). Something that usually remains hidden can be revealed using long exposure and under exposure. The image was taken with a Canon EOS-1Dx, an EF300mm f/2.8L IS USM lens, with an exposure of 1/15sec, f/14, ISO 50, and EV -1. 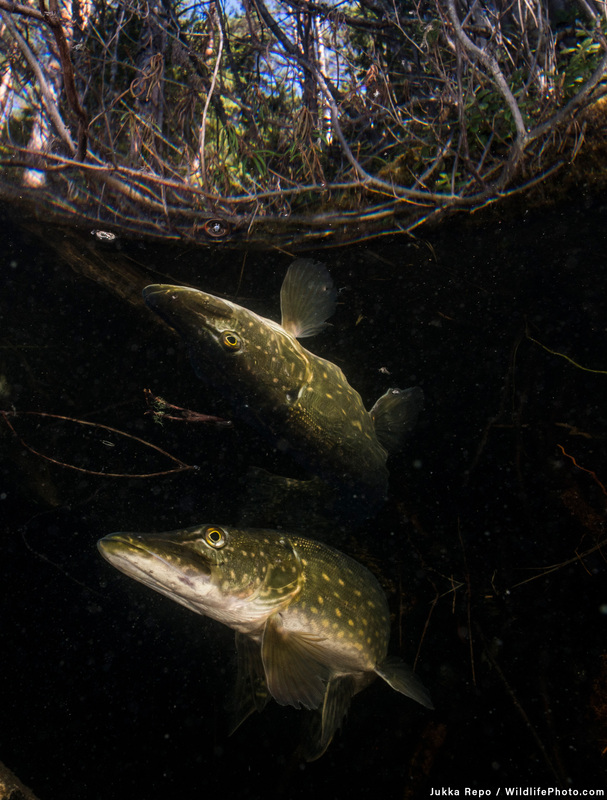 A pike lurking in the shadows with its reflection on the surface and some marsh forest in background. The photo was taken in a small lake in Southern Finland. 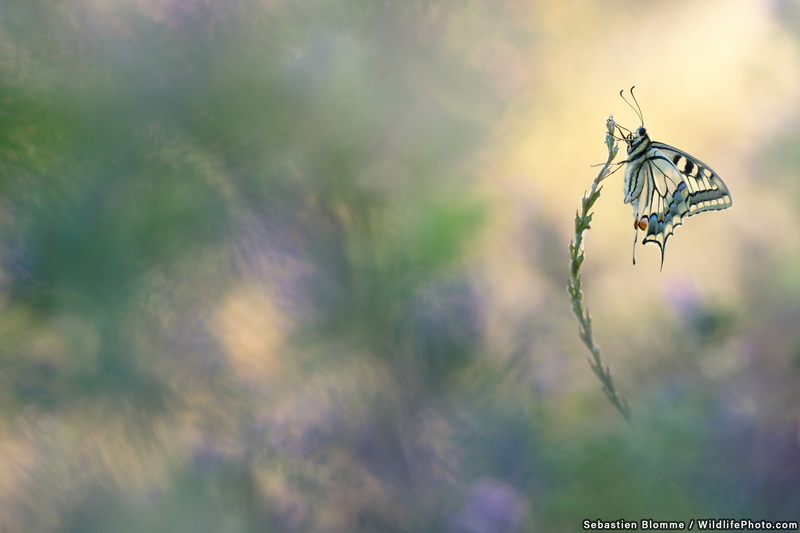 The Machaon is one of the biggest butterflies that can be found in France. However, this was only the first time I have been able to take its picture whilst it was waiting for the sun to dry its wings. 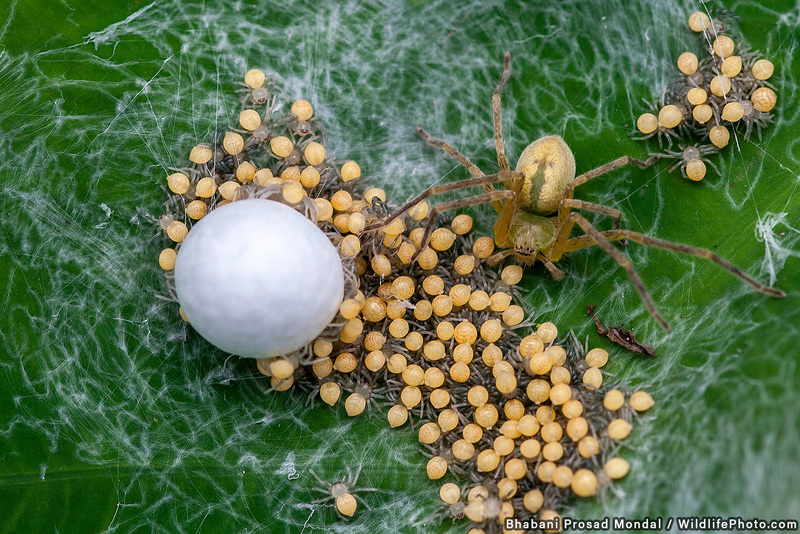 Newly-hatched spiderlings emerge from a white egg sack. 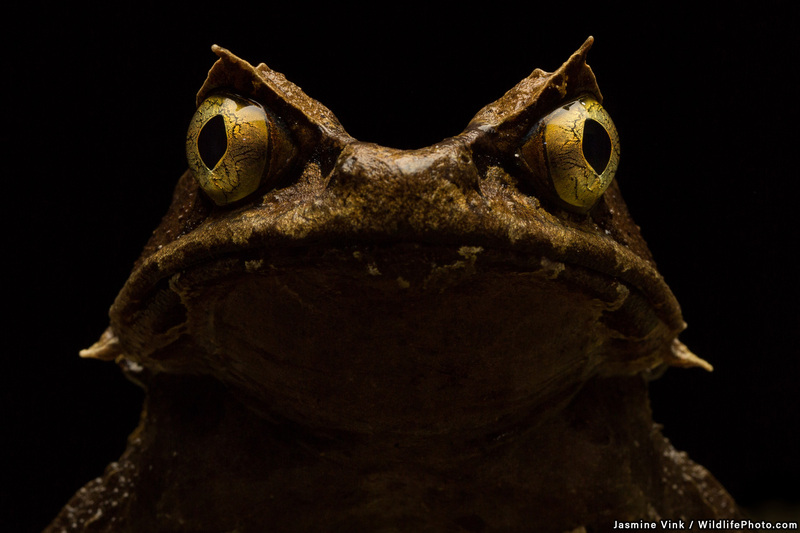 Megophrys kobayashii are an elusive and impressive species of frog found on Mt Kinabalu, Borneo.